Independence Health Group, Inc., (Independence) the parent company of Independence Blue Cross, LLC, reported strong financial results for 2017 with total revenue of $16.4 billion and net income of $77 million, or 0.5 percent of total revenue. Over the last five years, the company has increased revenue by 57 percent while consistently committing the overwhelming majority of each premium dollar — 86.4 cents in 2017 — to helping its members achieve and maintain good health. 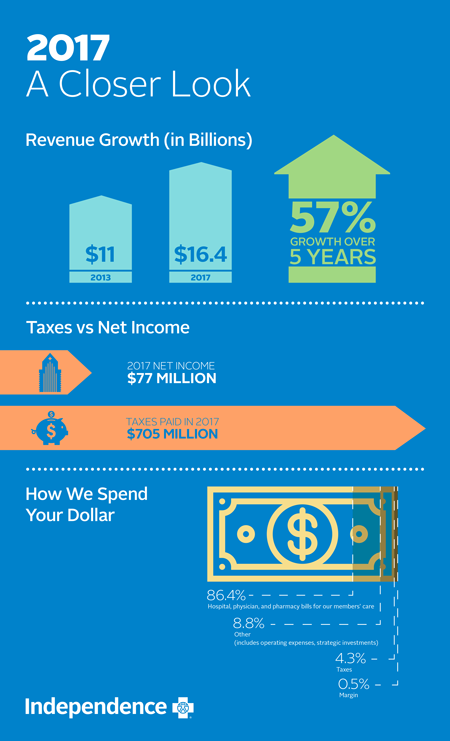 Independence paid $705 million in federal, state, and local nonpayroll taxes, including $289 million in gross receipts tax, $127 million in state premium taxes, and $2 million in Affordable Care Act-related taxes and fees. Independence did not receive refundable tax credits in 2017 associated with the recently enacted federal tax reform law because the company was not subject to the Corporate Alternative Minimum Tax in prior years. Independence’s performance can be traced to favorable medical cost trends reinforced by the company’s commitment to value-based care, as well as Independence’s strategy of diversification in the Medicaid managed care business. The company also continues to implement actions to improve operational efficiency. Strategic decisions to mitigate business risk also impacted Independence’s year-end results. This included the decision to exit the Medicaid managed care business in Iowa and the sale of AmeriHealth Casualty Insurance Company, Independence’s workers’ compensation business. For members: Achieve Well-being provides unique digital resources that help members create short, powerful action plans to improve their nutrition, physical activity, stress level, and sleep. A partnership with the Philadelphia 76ers elevated the Achieve member experience through personalized content that included tips from 76ers players and medical staff and high-profile rewards like tickets and signed merchandise. With providers: Highlighted by an innovative agreement with the University of Pennsylvania Health System, Independence’s value-based facilitated health networks model is the foundation of new partnerships with providers that go beyond traditional contract negotiations, building in better care coordination, robust data exchange, and shared accountability for both quality and cost of care. In the community: Independence’s commitment to leading community-based initiatives included a $10 million contribution to the Independence Blue Cross Foundation, in part to further its work to battle the opioid abuse epidemic in the nation. In 2017, Independence became one of the first insurers to restrict initial opioid prescriptions to five days, while also doing outreach to physicians who prescribe opioids outside of Centers for Disease Control and Prevention guidelines. In the second half of 2017, the number of Independence members using opioids fell by 22 percent and prescriptions decreased by 26 percent. Independence’s commitment to community service is also evident in the associates who make up the Blue Crew corporate volunteer program. Participation reached an all-time high in 2017 with nearly 1,400 volunteers donating more than 11,000 hours. Furthermore, AmeriHealth Caritas celebrated the 15th anniversary of its award-winning Healthy Hoops program, which has helped more than 10,000 children learn to control asthma and prevent heart disease while having fun. Through its subsidiaries, Independence closed 2017 doing business in 23 states and the District of Columbia and serving 8.3 million members in all 50 states. In addition, the company employed more than 10,500 people throughout the United States. The company ended the year with $2.6 billion in surplus, which is in the “efficient” range as defined by the Pennsylvania Insurance Department, and ensures that the company has the resources to pay claims and keep customers secure. Independence Health Group, together with its subsidiaries, serves nearly 8.5 million people in 24 states and the District of Columbia, including 2.5 million in southeastern Pennsylvania. In addition to a growing consumer business, Independence serves employer groups ranging from small businesses to national corporations. Headquartered in Philadelphia, Independence Health Group is a diversified company offering a wide range of services including commercial, Medicare and Medicaid medical coverage, third-party benefits administration, and pharmacy benefits management. Independence Health Group and Independence Blue Cross are independent licensees of the Blue Cross and Blue Shield Association.